Everything We Don’t Know, by Aaron Gilbreath. Chicago, Illinois: Curbside Splendor Publishing, November 2016. 359 pages. $9.95, paper. 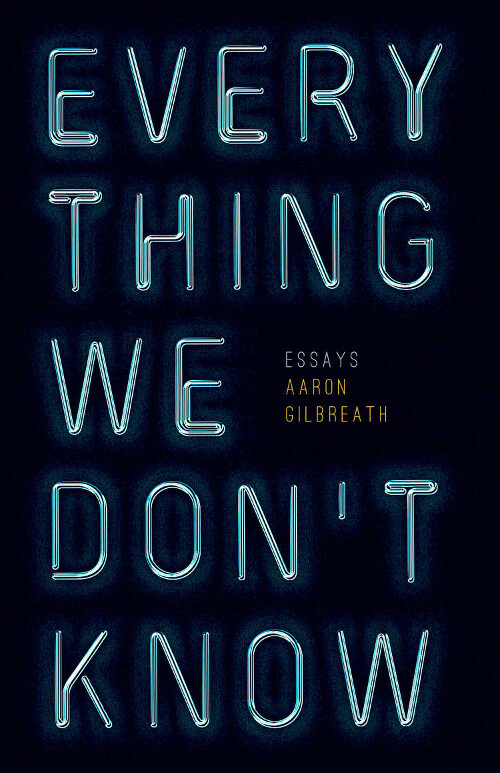 Aaron Gilbreath’s Everything We Don’t Know is a collection of essays about growing up, coming to consciousness, and taking responsibility for one’s actions and inaction. These intimate and honest essays tell stories about mistakes Gilbreath makes and harms he inflicts, and ultimately they’re also about his slow and winding journey toward compassion and care. Not all of the essays are particularly personal. Some are more sociological, cultural, and ecological. But all of them explore what it means to be human, and how we might become better at this endeavor. Gilbreath weaves together stories of the misadventures of his early adulthood with stories about his country, an era, and the planet itself. These essays show that everything—even everything we don’t know—is indelibly interconnected. An essay in the middle of the collection that gives it its name, “Everything We Don’t Know,” is a case in point. It’s about the Fukushima nuclear disaster and Gilbreath’s subsequent fears of radiation poisoning from eating Pacific fish, but it’s also about the interconnected web of life and his growing understanding that to care about—and take care of—one part of the web is to care for the whole. Drugs, and Gilbreath’s conflicted relationship with them, are in the background of many of these essays, starting with marijuana and progressing to heroin. Gilbreath finds that despite the initial calm they offer, drugs make it increasingly difficult for him to connect with others, with the world, and with himself. A major narrative arc in the book covers the process of becoming addicted to drugs, suffering from them, and finally working towards sobriety and honesty. The essays in the book are roughly chronological, covering ground from Gilbreath’s late teens through his mid-thirties, and landscapes from the Arizona of his childhood, to a brief stint in New York, and finally to the Pacific Northwest. It’s not a straight journey through these real and mythical places, however; it’s a winding, fraught path of self-discovery on the way to a gradual and sometimes painful dawning of awareness and maturity. In one of the book’s early essays, “Land Speculation,” Gilbreath tells a touching story of taking his girlfriend, Kari, to the emergency room after she gets stung by yellow jackets while they’re tripping on magic mushrooms in the forest. He’s at once guilty and panicked, not sure what to do or why this happened, and also trying to deal with hallucinations of the hospital walls breathing in and out. At the same time, he ponders the fact that he and his girlfriend are not, perhaps, meant for each other. It’s a moving essay about conflicted feelings and fears, and it’s also endearing, since, after all, he tries his flawed best to take care of his girlfriend, to do the right thing. From Eureka, I drove us straight through the coastal Mountains, turned south at Redding and aimed for Arizona, where for the next two and a half years we each carried secrets and secret intentions, holding our cards close to our chests, forever our eyes Devil red. This is a writer looking back at a moment that seems to be one of healing, but is in fact one of continued and deepening secrets. It’s also, however, a voice that understands that he’ll somehow work his way toward being the better person he wants to be. Soon she held out her hands, and when I’d deposited Wiggy in them, she cradled him in her seat, stroking him as she had this entire year, being so sweet to him, to me, to us, despite us all. Despite everything, Gilbreath seems to learn from Abby how to be a better person, a kinder mate, and a more thoughtful caregiver of his partners, his pets, and himself. I wondered whether to tell him to stay away from the hash browns and biscuits, to only eat the ham and not drown it in gravy. But I said nothing. I leaned against the kitchen counter, watching Dad collect his things. He patted my shoulder as he walked by and I thought: like believers to their religion, let Dad heed his own call. Go home, I now think, go to the place where your mother calls to you when it’s suppertime, go to her in your mind the way I can still go to you now. He sees, at last, that he’s as flawed as his father—and everyone else. His dad might make bad food choices, but Gilbreath himself struggled with drugs. What’s needed, he gradually understands, isn’t judgment and criticism, but compassion and care. The final essay in the collection, “(Be)coming Clean,” tells the story of Gilbreath’s journey toward sobriety via methadone. It’s also a psychological and spiritual trek toward recognizing his failings, the limits of his ability to overcome those failings, and the need, nonetheless, to keep trying. As he says near the end of this essay, “the only things that were clear to me were what I had done and what I still needed to do.” And that, perhaps, is a fitting place to end a collection that’s about everything we’ve done, as well as everything we still need to do.